Malaga overlooks the Mediterranean on Spain’s Costa del Sol in Andalusia. The Location Guide was invited to spend a few days touring the region to see what’s on offer for the international production industry just as Spain’s new 15% filming incentive becomes active. My dawn flight from London Gatwick may be filled largely with British holidaymakers, but it’s Malaga’s historical heritage – rather than Andalusia’s well-publicised resorts – that has an unexpectedly dramatic impact within minutes of arriving. The Alcazaba of Malaga (below) is an expansive Moorish fortification that overlooks this cosmopolitan Spanish city. Andalusia’s rich Muslim heritage stands guard above a modern, recently-opened waterfront complex as a striking statement of a city embracing its past and striving for a dynamic future. Dating back to the 11th century, the Alcazaba offers lush Mediterranean gardens, trickling fountains and winding thousand-year-old city streets. 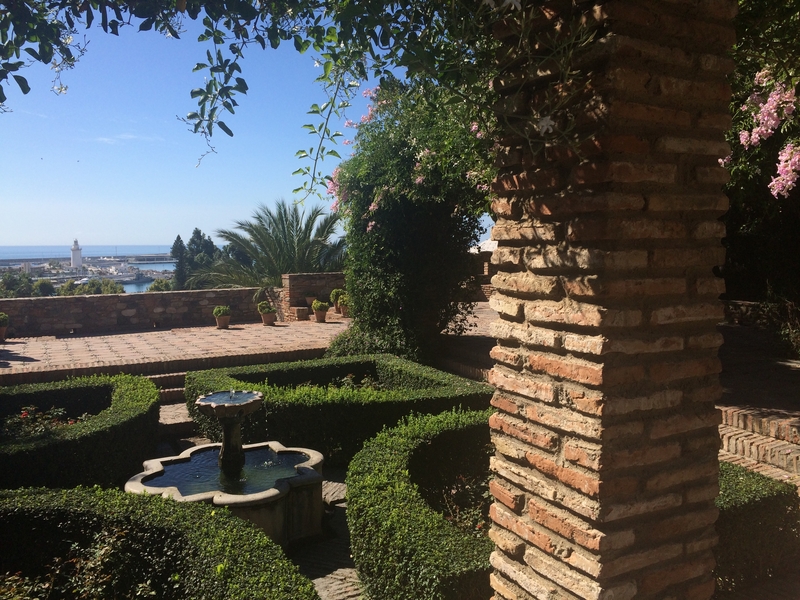 A popular tourist attraction, the Alcazaba is buzzing with activity as we navigate its historic labyrinth. The location has been filmed before for small-scale biblical TV dramas and documentaries, but still awaits big-budget international shoots. A more sedate setting is the castle on Mount Gibralfaro, a few minutes’ drive from the Alcazaba, which offers panoramic views of the sun-baked city from an extensive network of battlements. Andalusia has had many movie-making triumphs but they have been isolated and scattered over decades. Iconic historical epics Cleopatra and Lawrence of Arabia complemented the spaghetti westerns of the 60s. Ridley Scott's biblical epic Exodus: Gods and Kings and now Game of Thrones have spotlighted the country on the global stage, and with the new national filming incentive Andalusia has a real chance to shine once again and build on its filmmaking heritage. When we add the tax incentives that entered into force in January 2015, I sense a place full of opportunities for the sector’s future. “I feel very happy that we have the great opportunity to show the monumental cities of Malaga, Antequera and Ronda, with its beauty and history and, of course, the magnificent locations that the province of Malaga can offer,” says Paulino Cuevas, the co-ordinator of my trip through Euromedia Production Services. Beyond Malaga’s city limits, extraordinary landscapes have only recently become safely accessible. Nearby Caminito del Rey (left) is a 105-metre-high pathway that runs for several kilometres bolted to the sheer side of the El Chorro gorge. A pathway was first set up over a century ago to provide workers with access to two separate hydroelectric plants, but the route gradually fell into disrepair and was closed following the tragic deaths of several workers in 1999 and 2000. A new pathway has since been erected by the government at a cost of nearly EUR 3 million and only just reopened to the public in March this year. It’s already been rated by Lonely Planet as one of the world’s top new travel experiences. The route is spectacular and the path itself feels sturdy and secure. Hard hats are issued to all walkers to protect against the possibility of small rock falls from the peaks above. Sections of the old pathway – precarious, rusty and pocked with holes – remain just metres below the new route, offering a glimpse of what workers used to have to contend with. The new pathway culminates in a steel suspension bridge across the gorge, which sways gently as I stride across, softly humming the Indiana Jones theme tune in the midday heat. 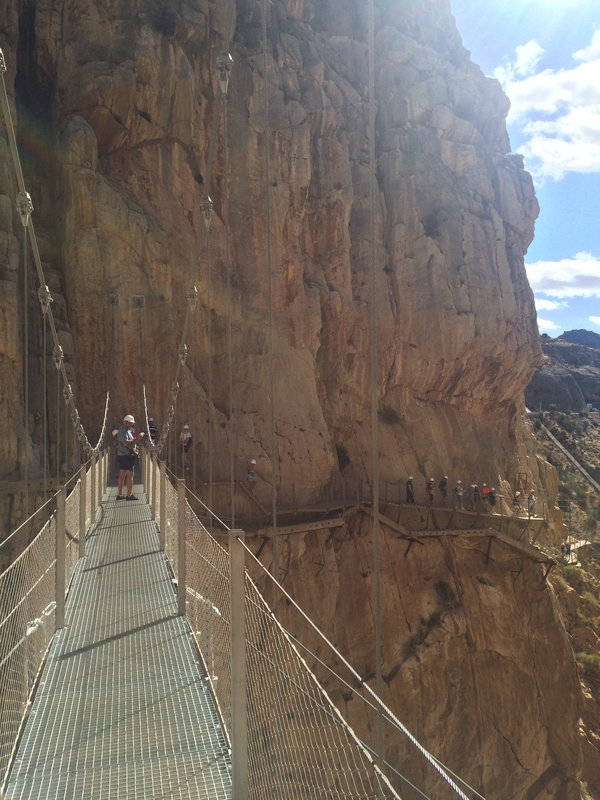 The production value of Caminito del Rey is less obvious than its tourist appeal. Safety would clearly be a major issue, with little space for more than a presenter and a camera on the narrow walkway. But it’s a dynamic location that’s perhaps better as a source of scenic delights for crews looking to unwind between shoot days. 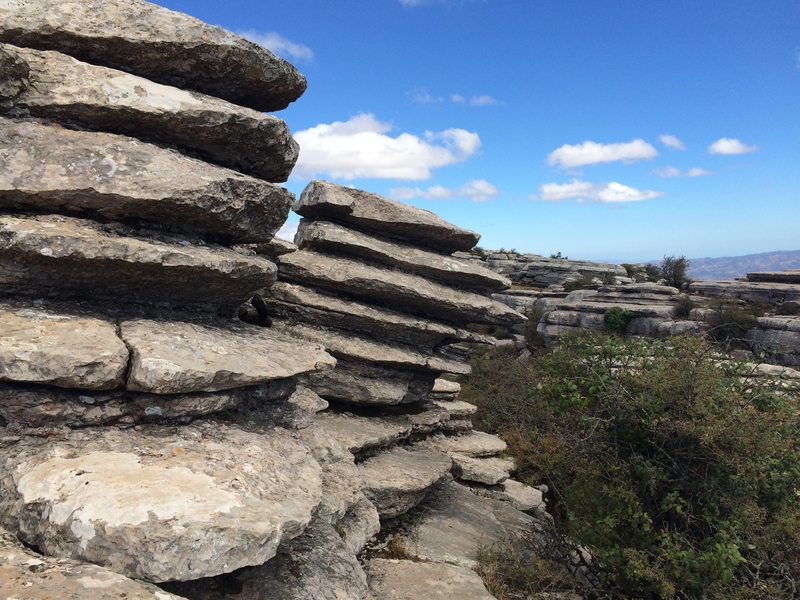 From Caminito del Rey we move east to El Torcal de Antequera, a location characterised by limestone rock formations (right) spectacularly carved by rain and snow over the millennia into incredible horizontal disc formations. At first glance it looks more like an immense artwork sculpted by talented human hands than a staggering natural monument. 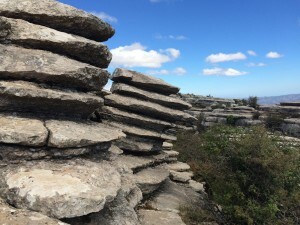 Immediately more accessible than the El Chorro gorge, El Torcal has been used as a distinctive filming location in a collection of commercial and documentary shoots. It’s a terrific showcase of the effects of the elements on limestone and a hypnotic place to visit. 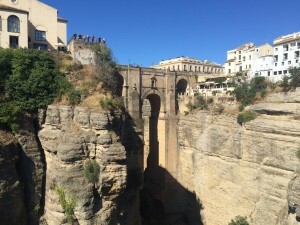 Cliff-top building is a key feature of the spectacular geography of Ronda, an internationally-renowned historic city and major regional tourist attraction that’s a 90-minute drive from Malaga. Ronda dates back to ancient times but now is distinctive for its Moorish quarters and its more recent 15th century ‘new’ town. Ronda is an architectural marvel, a series of grand buildings perched on a mountain. Among the city’s defining features is its 300-year-old Puente Nuevo Bridge (below) that rises 100 metres above the El Tajo gorge. It’s a sight to behold up close and a wonder that 18th century engineers were able to rise to such a foreboding construction challenge. Ronda is an architectural marvel, a series of grand buildings perched on a mountain, while smaller stepped terraces offer a winding and sedate experience of the city’s inner architecture. Malaga is not just a showcase of geological history and ancient architecture. A short drive from Ronda brings us to the Ascari Circuit, a privately-owned motor racing track set in secluded and luxury surrounds. Primarily a playground for wealthy supercar fans – the place has its own helipad which offers access to the airport in minutes – the track is also a popular venue for car launches and TV shows. Top Gear has visited more than once. It’s potentially a useful location for production crews seeking a track having perhaps already filmed a new supercar against the exotic background splendour of Ronda. Studio facilities are available in Malaga but have so far focussed on local TV productions. 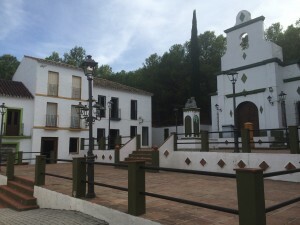 The picturesque Loasur Studios is located 20 miles from Malaga in the city of Coin and offers four stages, the largest of which is 1,100 square metres, along with full post-production facilities. Notably, the set for the short-lived BBC soap Eldorado still stands near Loasur. The site (below) is a remarkable achievement, comprising a small ghost town that was built in a matter of weeks back in the early 90s. On first glance the place seems like merely a sedate country village in the afternoon sun, until a glance through the windows reveals box-like empty interiors. The village has been used only sparingly as a filming location in the two decades since the show was cancelled, and in fact finds more regular use as an Airsoft gaming area. On the outskirts of Malaga are La Concepcion Botanical Gardens, which offer filmmakers a controlled exterior environment of sorts. First created nearly 200 years ago by the globetrotting Marquis of Loring and his wife, the gardens were officially recognised as historic in the 1940s, before finally being bought by Malaga City Council and opened to the public in the mid-1990s. They offer a variety of themed gardens and trees from five continents, as well as a secluded mansion that was once home to the Marquis and his wife. Malaga has plenty to offer the international production industry and its position will be strengthened by Spain’s formal filming incentive. Andalusia also has a rich Mediterranean culture waiting to be explored in production downtime. Fresh seafood is a central part of the local cuisine, delicious washed down with a glass of locally-produced organic wine. The picturesque Loasur Studios is located 20 miles from Malaga in the city of Coin and offers four stages. International connectivity is easy, as is domestic travel, with Malaga just a few hours from Madrid and Barcelona on Spain’s high-speed rail service. Malaga’s southern location delivers 320 days of clear skies a year and the temperature hovers at 30 Degrees Celsius throughout my mid-September visit. Capitalising on Malaga’s historical heritage is likely to be a prudent move for the local authorities. The government may need to consider amending its strict rules regarding commercial production in historic sites, if it is to truly open itself up to the world. Game of Thrones is already shifting the global spotlight to Spain and Malaga has everything to play for in building its production future. Nick Goundry travelled as a guest of Turismo Costa del Sol and co-ordinator Paulino Cuevas of Euromedia Production Services.